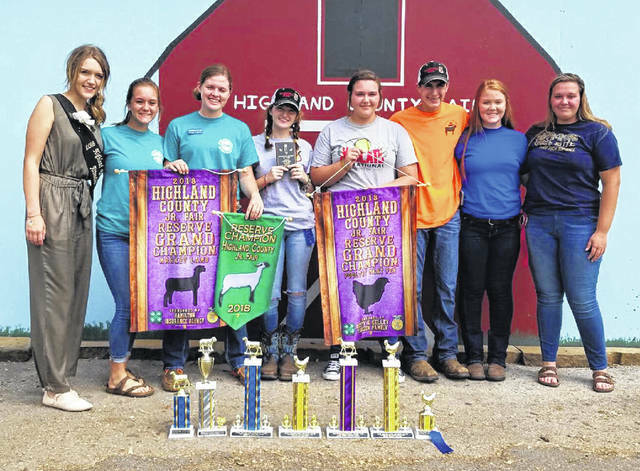 Fairfield FFA members were active in the 2018 Highland County Fair. Paige Teeters was a Jr. Fair Board member and had the Reserve Grand Champion Market Lamb, Reserve Showman, Grand Champion Ewe, Grand Champion Ram, first and second in sheep class, first and second in open show hog, first place Hampshire Ewe class, and also second and fourth place Jr. Fair Hogs. Alexis Tompkins was a member of Jr. Fair Board, first place nail box and third place sunflower. Allyce McBee served as the poultry ambassador, first place in her class for her Market Meat Pen Chicken, and first place in her class showmanship. Teigan Thackston received first place in the Avian Bowl, third place overall in Poultry Judging, third in showmanship, as well as two firsts and one sercond place in art. Gracie Lawson won Reserve Grand Champion for her Market Meat Pen Chicken. Bri Burleson was second in her Market Goat Class and was the a fair queen atendant. Kohler Bartley received third place in his Market Meat Pen Chickens. Rachel Schuler was a member of Jr. Fair Board and placed third in her class with her Market Meat Pen Chickens. Many other members received awards with their fair projects and represented the Fairfield FFA well. https://www.timesgazette.com/wp-content/uploads/sites/33/2018/10/web1_FairfieldFFA.jpgFairfield FFA members were active in the 2018 Highland County Fair. Paige Teeters was a Jr. Fair Board member and had the Reserve Grand Champion Market Lamb, Reserve Showman, Grand Champion Ewe, Grand Champion Ram, first and second in sheep class, first and second in open show hog, first place Hampshire Ewe class, and also second and fourth place Jr. Fair Hogs. Alexis Tompkins was a member of Jr. Fair Board, first place nail box and third place sunflower. Allyce McBee served as the poultry ambassador, first place in her class for her Market Meat Pen Chicken, and first place in her class showmanship. Teigan Thackston received first place in the Avian Bowl, third place overall in Poultry Judging, third in showmanship, as well as two firsts and one sercond place in art. Gracie Lawson won Reserve Grand Champion for her Market Meat Pen Chicken. Bri Burleson was second in her Market Goat Class and was the a fair queen atendant. Kohler Bartley received third place in his Market Meat Pen Chickens. Rachel Schuler was a member of Jr. Fair Board and placed third in her class with her Market Meat Pen Chickens. Many other members received awards with their fair projects and represented the Fairfield FFA well.